DCE Cindy Namanny organized the “Socks of Love” project. Church members collected and donated new socks, travel size toiletries, snacks, and other items useful to the homeless. 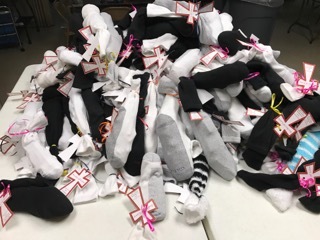 After the weekly Wednesday prayer service led by Pastor Scott Henze, the congregation assembled 250 pairs of socks of love. These were distributed during lunch at Stewpot Ministries in Jackson, MS.